Maximilian Dresden Electrorock Essence of Mind is back with their second album, 'Indifference', released on the Alfa-Matrix label. This 11 song CD shows off what Essence of Mind is all about musically. There is also a Bonus Tracks version of this album with eleven remixes, and there is an excellent remix of "Indifference" and "It's Killing You" by Kant Kino, which alone, makes the bonus version worth buying, along with some other great remixes. They have also appeared on some compilation albums. Essence of Mind's band members are - Erlend (vocals,music,lyrics,production) - Alex (guitars) - Christian (live keys). "The Opening" is what it says. It is a sample of what is to come and opens the album. "It's Killing You" has some great vocals and chorus hooks. Essence of Mind songwriting skills are definitely shown off in this album. "Indifference" is a good choice for the album title track. I think it highlights a lot of what the album has to offer. It is filled with god vocals and guitar riffs. Their only professionally done video is for "Indifference" and looks great. It shows off exactly what the band is about. "Some Kind Of Entertainment" has an Electronica-Rock sound to it. "In The Night" has a great melody line and wonderful vocals. This is a great ballad song. "Scars" has good lyrics, but the song is not one of my favorites from the album. "No Denial" shows off more synthesizers and has more of a soft rock style. "Retreat" gives us more Electronica/Rock styles and vocals. "Aldrimer" goes into a more synthesizer based song. The vocals are soft Electronica in style. "Desperate Times" incorporates vocoded vocal bits and hard driving rock beats. "In Line" is more electronic and medium style, not danceable, not hard-driving. 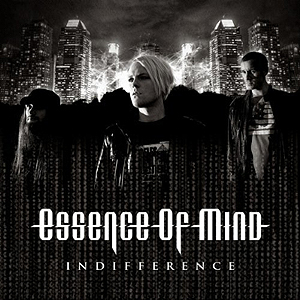 Essence of Mind is back with their second album, 'Indifference', released on the Alfa-Matrix label. This 11 song CD shows off what Essence of Mind is all about musically. There is also a Bonus Tracks version of this album with eleven remixes, and there is an excellent remix of "Indifference" and "It's Killing You" by Kant Kino, which alone, makes the bonus version worth buying, along with some other great remixes. They have also appeared on some compilation albums. Essence of Mind's band members are - Erlend (vocals,music,lyrics,production) - Alex (guitars) - Christian (live keys). After hearing the entire album, their style reminds me a lot of Linkin Park, but with more Electronica put into their melodies. This is a solid album and I don't see too many issues with the songs. The songwriting and vocals are very polished and they have a professional sound and would fit a lot of different radio genres. Make sure you check out their music video for "Indifference". It seems to portray a true image of what you can expect from this band. This genre is not really what I would go out and buy, but for people who like this style, there is no denying their songwriting skills, musicality and performance quality.